This will be a very quick post....I just wanted everyone to know we are ok, but as you can see from the photos our home is gone and with it every personal item. I am most sad my husband’s paintings did not survive. I am most sad all the trinkets and handmade items from my kids, grandkids and friends are gone. 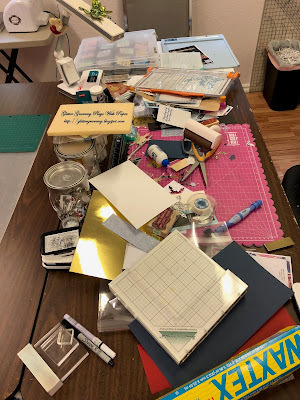 I am most sad about loosing every craft item that I have collected for the past 20 years. I am most happy we survived as many did not. 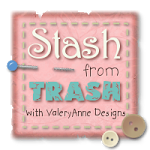 Not one of my craft friends homes were spared, but all were able to live to share their story. I will be absent for the next several months as we will be moving from California to Illinois, to be closer to family. I am sad to leave my friends, but like the embers of the fire floating to locations far and near, they too will be finding new areas of the state and country to live. No one ever expects to get up in the morning, have coffee and then run for their lives. 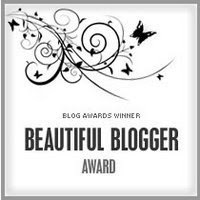 One day I may share a blog post about that day, but for now, we are looking forward not backward. Thankfully the internet will allow me to stay in your lives through your beautiful creations. I look forward to the day I can again share with all of you. Happy Saturday everyone. I'm thinking Christmas lately....I wonder why. Maybe it's the turning of the season....or maybe it's just looking at the calendar. A bit ago, I was watching Jennifer McGuire make what she called the inside Shadow Box Card. 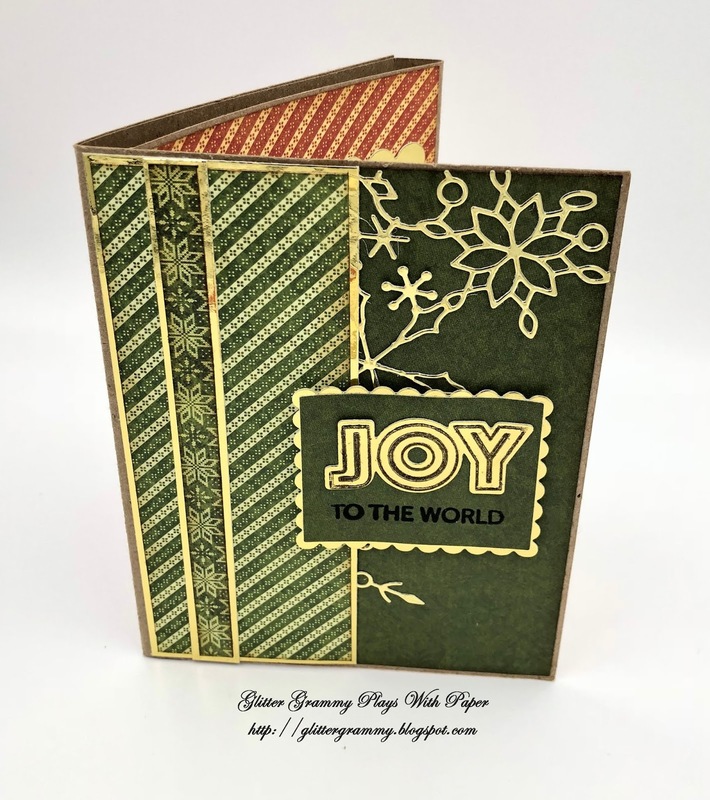 I'm attaching a link where Jennifer gives directions for this easy to make card base. Check out the directions here. If you aren't familiar with Jennifer, she is one of the best. Her videos are easy to follow. 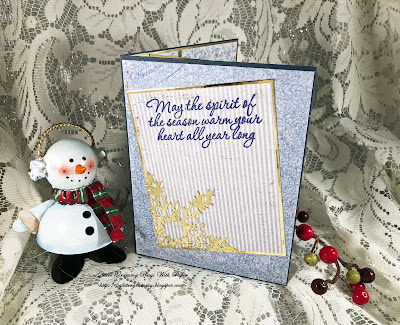 My card was made using Graphic45 Winter Wonderland card stock. 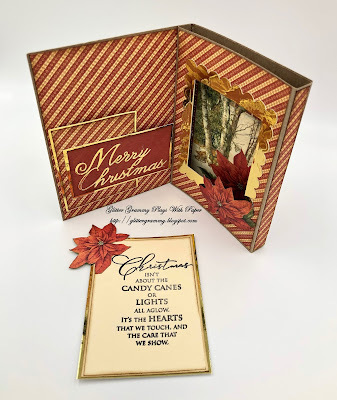 i used Kraft card stock for the base and gold mirror card stock for the sentiment and to frame the decorative papers. 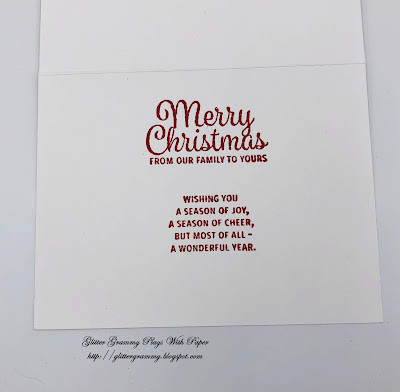 The sentiment is Penny Black #30-508. 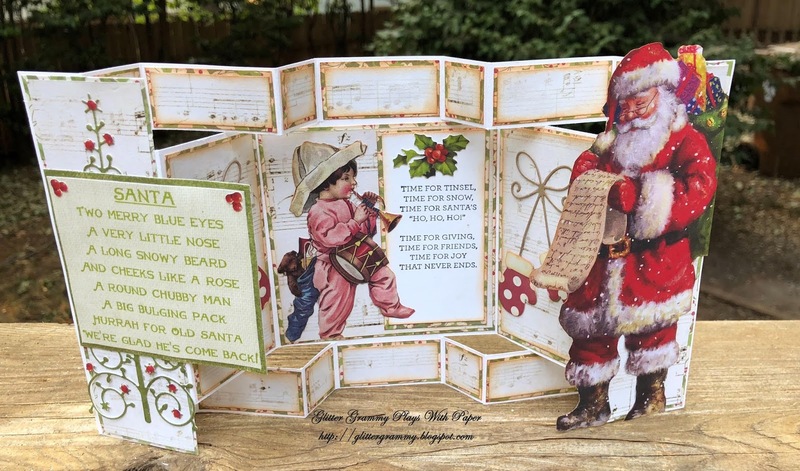 The Merry Christmas is from Poppystamps #1105. A little fussy cutting and the inside is finished. The Sentiment tag is removable as you'll see in the next photo. And now for the outside of my card. 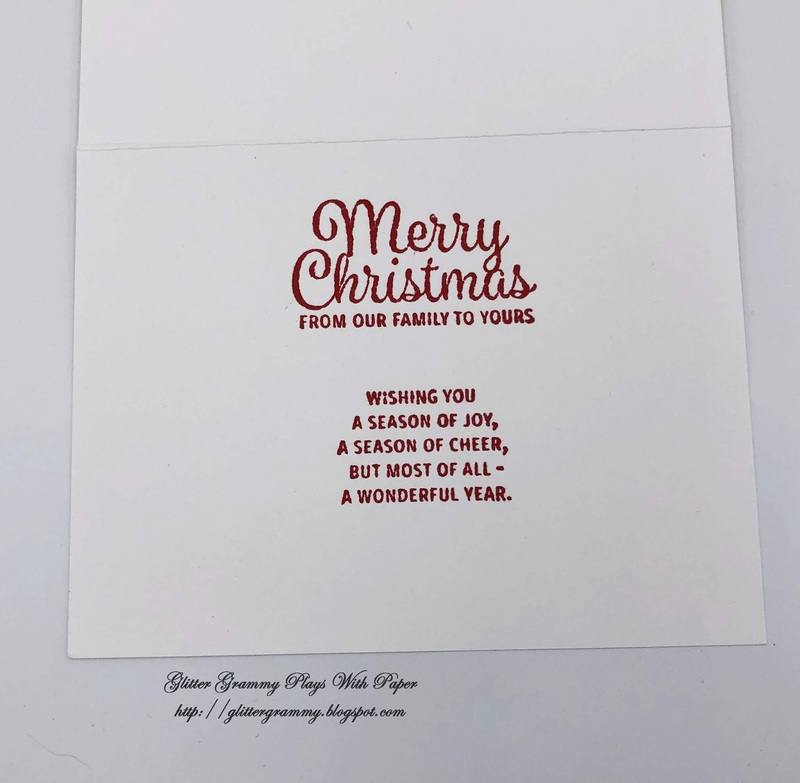 The same paper line was used for the outside of this card. 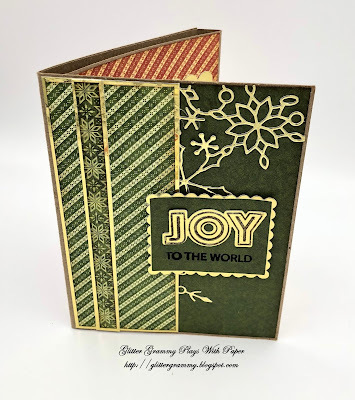 My joy die and stamp is Poppystamps #CL467. This die and stamp set is fast becoming a favorite of mine. 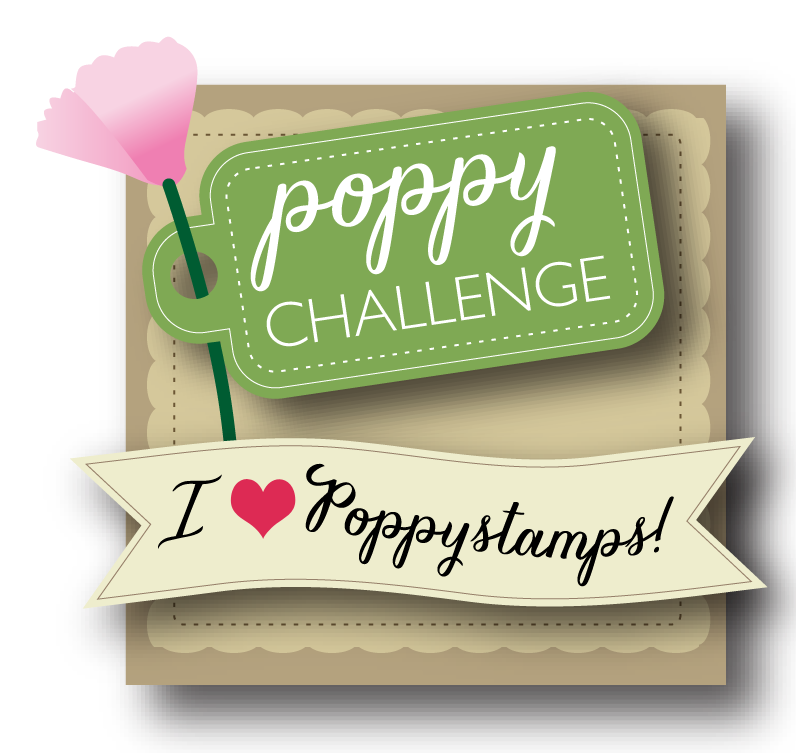 Mostly hidden is a Poppystamps die that at present is on loan, I can not remember its name. Well that's it for now. It's time to clean up my mess so I can start another one! Heads Up, I'm having a problem commenting on anything blogspot....a problem that is baffling many. I just want you to know, I am looking at your pages, I just can't tell you how wonderful your creations are. I hope an answer can be found soon. 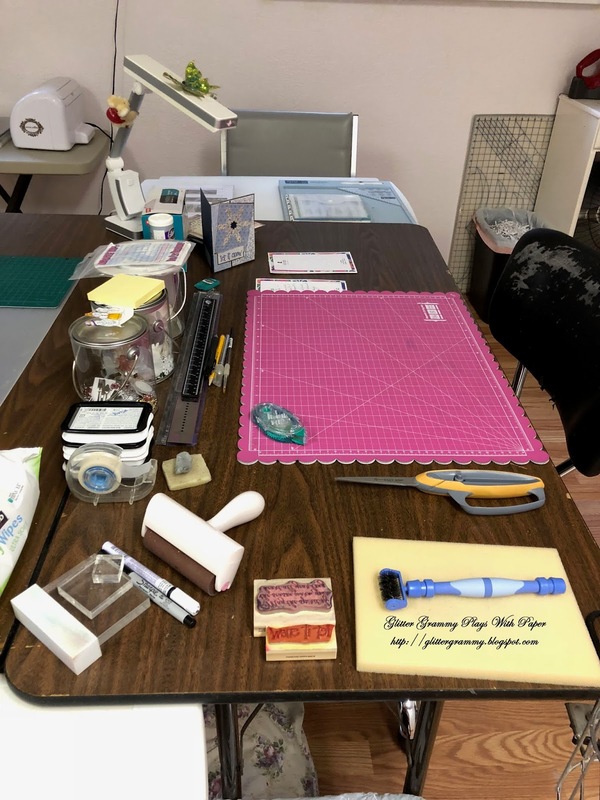 Until next time, Happy Crafting and Hugs from my world to yours. 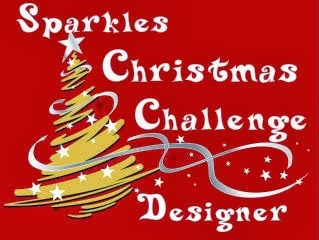 This is my Sparkles Christmas Challenge for this month. Sybrina chose this theme, which is Christmas Is For Kids. This is mine. Santa is always keeping track of the naughty and nice list...I wonder if it is now a spread sheet? Santa must have an elf or two that is computer savvy. This card was fun to create. I like the base format, which has many names, but the one I learned from was called an Imperial Card and it probably can be found on Heartfelt Creations. I cut the base from 6x12 white card stock. 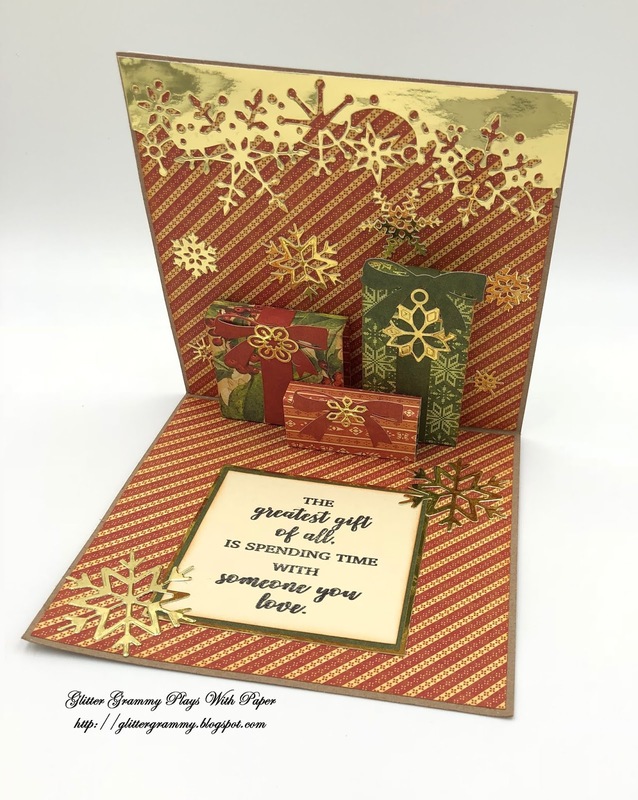 The decorative paper is Kaiser Craft - Silent Night Collection, which is not new, but hopefully can be found somewhere on line. 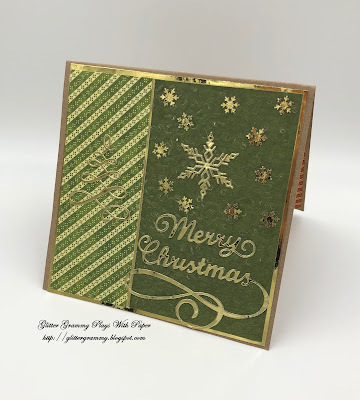 I also used Authentique Christmastime Evergreen. You barely see this one, as it is only peaking out from under one of the frame layers. Sadly I don't know the name of the designer paper where I cut the front sentiment. It was a scrap. The tree on the outside panel was cut from a Memory Box die. The tree was not large enough to go from top to bottom, so I cut it, and stretched it . The sentiment covered it, a nice way to get more from your dies. 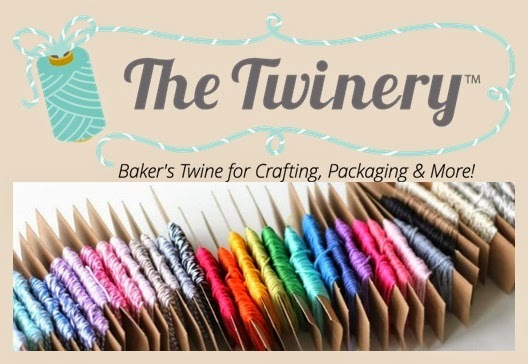 The mittens are also Memory Box and cut from Kraft paper, and decorative paper. The inside sentiment is from Stamping Up and it fit perfectly....that was a happy accident as Bob Ross would say. Here's what my card looks like closed. This card was really fun to make. I'm not sure which little or big kid will receive this card, or maybe I'll just keep it for one more year and use it as a decoration. Now....it's your turn. I look forward to seeing your creation. So get those crafty supplies out and get inky or gluey and share what you've made with all of us at Sparkles Christmas Challenge. You know, when you get a new die, you've just got to use it. This die is My Favorite Things - Die-Namics - MFT-1353. This die makes a very quick card. 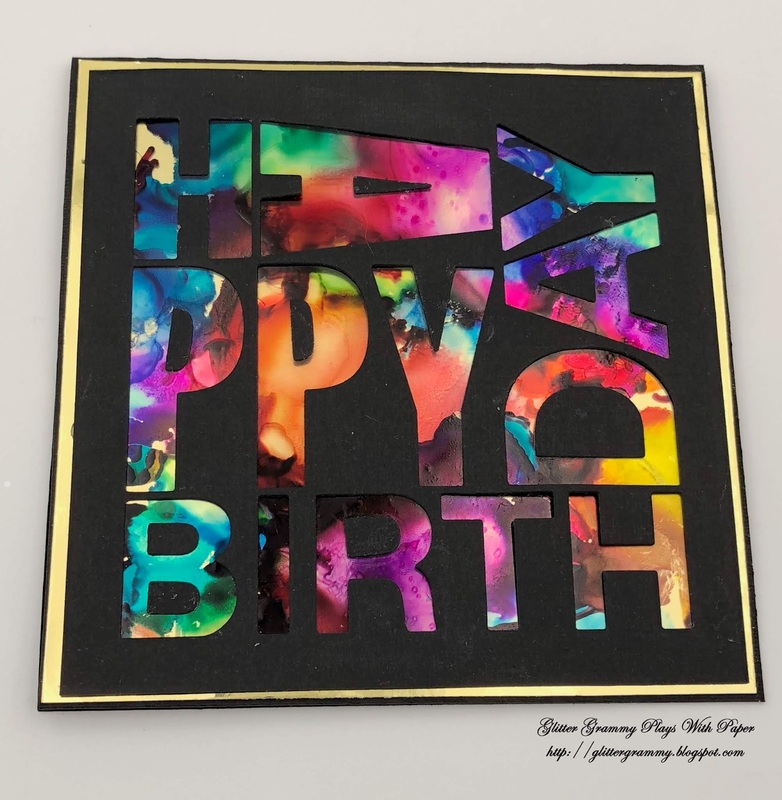 I cut the die on black card and backed it with a piece of plastic page protector that I had alcohol ink painted. There are tons of videos on line showing this process on plastic. 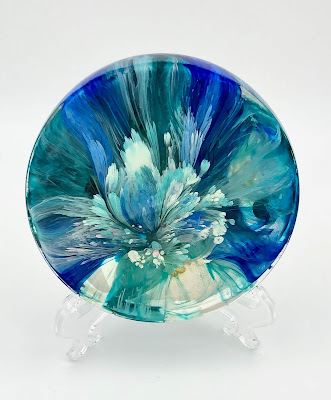 One of my favorite alcohol ink artists is Jodi Martinez. If you look back to my post of August 1st. you can see links to her instagram and FaceBook pages. For this card I used Tim Holtz Alcohol Ink re-inkers and Tim Holtz Mixatives. I backed the alcohol ink painting with gold mirror card and it really helps to reflect the colors of the ink. It's funny, what goes around comes around. I think I did my first alcohol ink painting 15 years ago. I'm glad it's making a comeback and there are lots of new ways to paint with the ink. Doing this painting on window plastic or any stiff plastic is very easy. Jodi uses epoxy for her pieces of art. Which she is selling on Etsy - Here Check out her work. She is making videos of how to, so keep your eyes open for them. My neighbor, her sister-in-law, took a few classes and for my birthday Jeri gave me this lovely piece of art. I love it. Thank you Jeri Cude for gifting me this beautiful piece. I see a class or two in my future......It will be a fun girls weekend that's for sure. So....that's it from me. 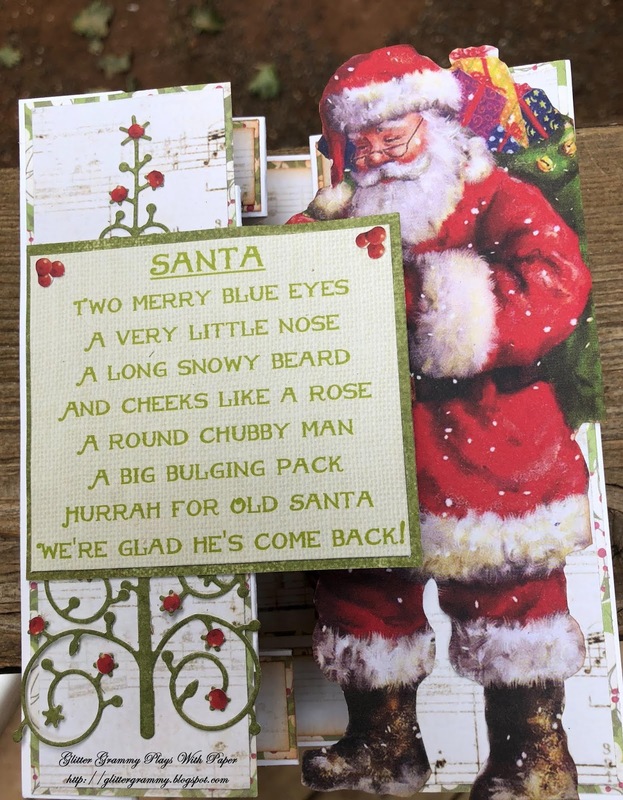 I hope you've enjoyed my card and I do hope you check out Jodi's work. As always, thank you for stopping by. Happy crafting and I'll see you soon. 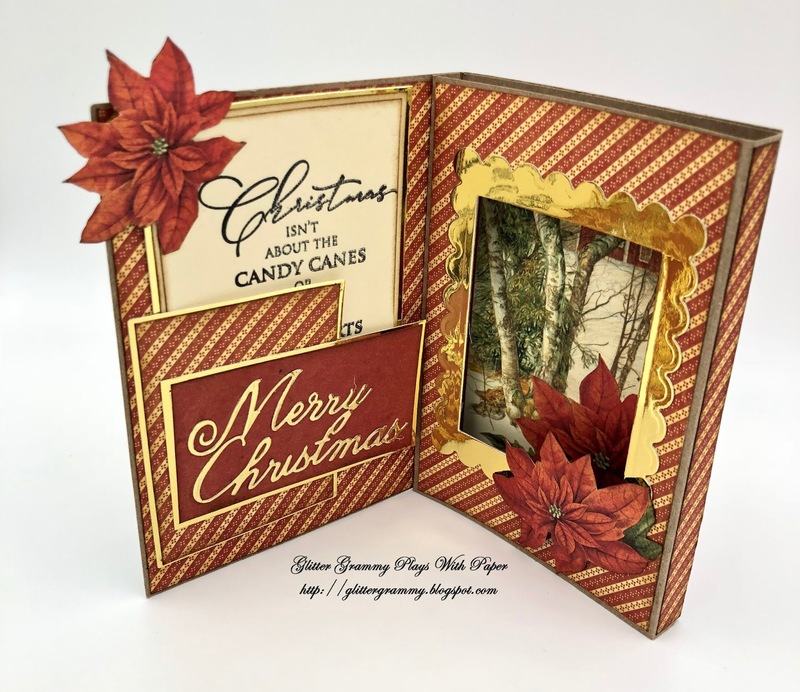 I'm sure everyone is thinking about the end of summer, the beginning of the school year and for many of us creating Christmas cards. So, here is my Sparkles Christmas Challenge card for September. 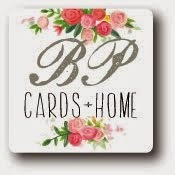 Pat chose the theme for this challenge the cards need to show blue and gold. When I sat down to create my card, I was sure this was going to be a quick one for me....boy was I wrong. My original plan didn't look on paper like it did in my mind. So into the trash bin went idea #1, which I'd tried cutting 4 times. The die, a large one just wasn't cooperating. I decided to move on to idea #2, which is based on what you are seeing now. What I did realize...I don't have Christmas patterned papers in blue and I thought I had many choices of blue solid papers....guess what, I don't. At this point I was getting a bit frustrated. While going through my paper pads, I found a 6x6 pad that is not Christmas, but it is blue. My card is made from Vintage Romance by Maja Designs. I love the papers, but they are not Christmas themed. The patterns are tiny and I think rather quilt like. I think these four papers worked well for the front of this card. My snowflake was die cut from a Memory Box Die - Bianca Snowflake #98193. I first cut the die using a gold mirror card stock, but it was just too shiny. I cut the design again using a mottled gold card stock. I liked this cut much better. I did use the mirror gold to frame the layers of blue card stock. 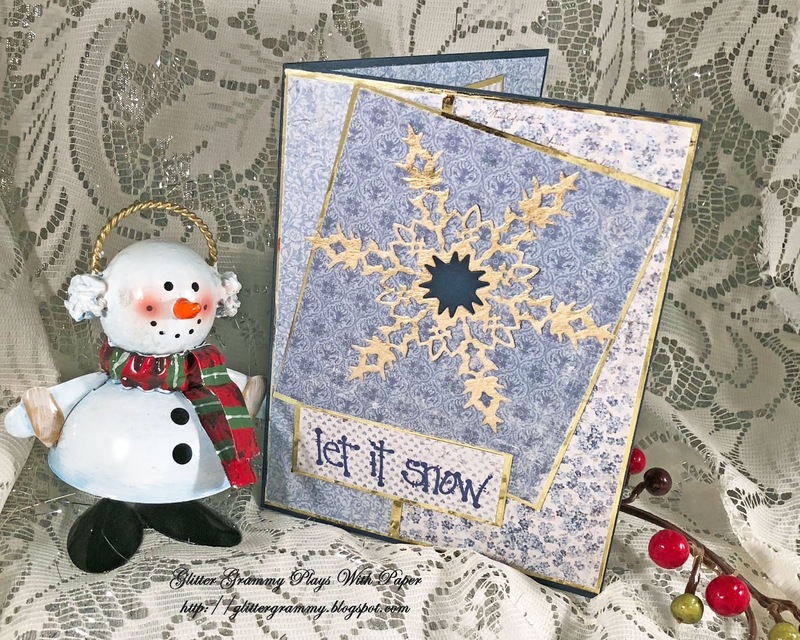 The sentiment "Let It Snow" is a 1995 Annette Allen Watkins stamp - #C1371. The center of the snowflake was cut from a piece of scrap blue card stock. The inside of my card uses two more pieces of the Maja Design paper and I added 1/2 of the mirror snowflake I originally cut to use on the front of the card. I do like the look. 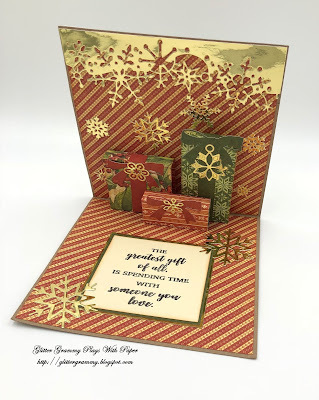 My sentiment is from Stampabilities - 2008, Warm Your Heart - GR1145. That's it for my inside and out. I hope you too will take some time to create a blue and gold card and share it with the Sparkles Christmas Challenge. I think my helper was a bit tired today. 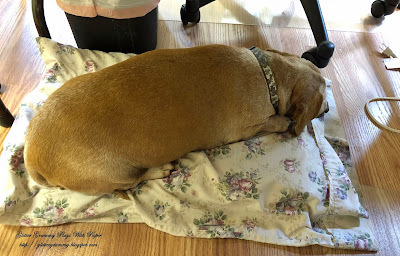 She is always at my feet when I create. I do tend to make a mess when I'm in creative mode. Thankfully, if I clean up after each creation it's an easy and quick process.....Here's what my desk should look like. Well, I guess I'm ready to start my next creation. Until next time, Happy Crafting, I look forward to seeing your blue and gold creations.